ALL THIS RE-BRAND TALK NEEDS TO STOP NOW..
Get this season back on track our owner will do what ever he wants at the end of the day. Theres an old saying NO PLAYER IS BIGGER THAN THE CLUB - WELL IN TRUTH NO OWNER IS EITHER.. Correct me if I am wrong but no one from the club has officially raised or suggested a name change. A load of rumours on Twitter has exploded so that fans talk about nothing else. They have stopped talking about rugby, or how well the team are doing. Is is quite pathetic. If you expect any organisation to publicly deny every rumour, made about it you are deluded! The rebranding consideration is not a rumour but fact as evidenced by Mr Koukash himself on Friday night and by Robbie Paul a few weeks previous on radio 5 live. It IS 100% on the agenda. Am I saying it will defiantly happen? No, but it IS i repeat IS being considered. Would any of you bet against it happening? Think it is a given, just hope the team concentrate on continuing our best season in decades and maybe taking Salford out with a bang. MR, I don't think it will happen. No inside information but it's illogical. Put aside the legacy argument,as he will, but he'll realise that the downside of the name change is far greater than what he'll gain in practice. He's not daft and he'll find a convenient way of dropping it and Robbie Paul will end his consultancy. I totally agree,let's get on with enjoying the season,then at the end of the season / beginning of next season when/if the announcement is made make your own decision on the future. Thanks Chico, I had missed it. I'm not sure what was expected from Big Nige' or the RFL here. In these instances it is a rubber stamp and only when they want to punish a new set of players or a brand new club do they truly burst into action. 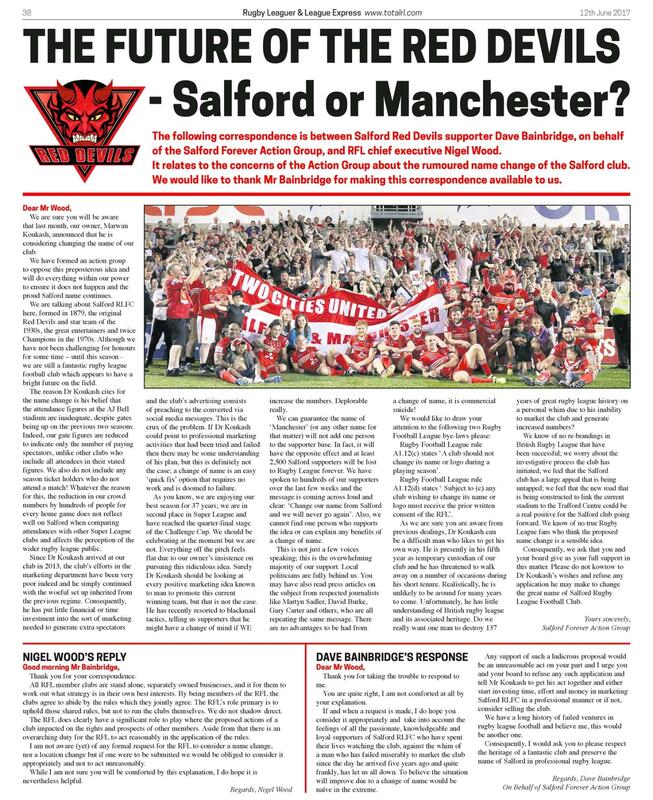 Also it is a very big assumption that everyone agrees with keeping the name Salford. The abusive attacks on MK are silly for obvious reasons. Have we had a poll on here to see what Deviltalk folk think? That might be a decent starting point. russ I'm not sure what you mean by a suggesting poll i.e. what would the question be? Would you be happy at changing Salford's name to Manc? I suppose.It should be easier and less clouded in lies than Brexit! There may be just as much prejudice involved though! I'm pretty sure it would be 100% No and 0% Yes! That's spot on, bgm. The differences arise when you ask if fans are going to stop supporting the team if we do become Manchester. While the publicity is welcome, the dislikes and personal opinion in the original piece and the reply let it down imo. I don't really read it being overly negative, the points had to be raised. No point beating around the bush and it wasn't an inane rant. Well certainly not you and Carnster it seems.But I am certainly sure we speak for quite a few.